Well, folks, there goes the month of September! And what a fun filled month it was! 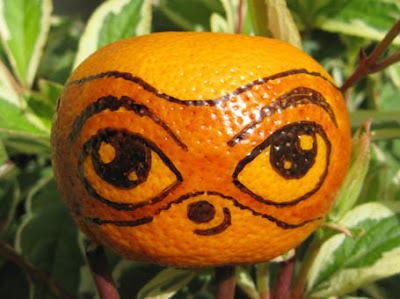 A month in which we met a lovely egg head, an awesome orange, and even some super cute kittens! 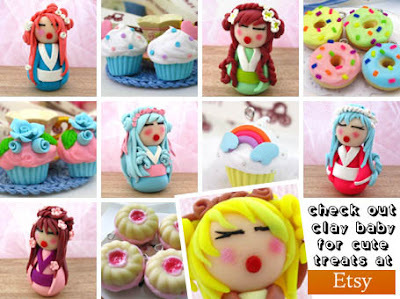 And what about all those cute designers we met like CandyDoll Couture, Hand Critters, and Clay Baby to name a few! And let’s not forget our monthly puzzle! Did you work out who the Imp Mascot “borrowed” her accessories from? Amazing! It was A: Outlaw Mascot, B: Stereo Mascot, and C: Gent Mascot! Congratulations to everyone who got them all right! Please feel free to celebrate this achievement in a manner you deem appropriate - perhaps by making a cup of tea or something! Anyway, that’s your lot for this month, but be sure to come back next month when we’ll have a special kawaii treat for all you cute and creepy fans out there! That’s right - it’s time for our annual Halloween extravaganza! And, as you can see, I wasn’t wrong! 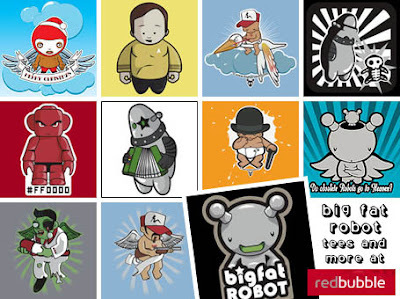 Big Fat Robot is a RedBubble shop that sells t-shirts, kids clothes, and stickers - all adorned with amazing designs from an incredibly talented illustrator from sunny Melbourne, Australia. And, speaking as a fan of all things sci-fi, I can definitively say that this shop is one of the best I’ve seen. And the absolute best part… it’s a shop with plenty of robots in it! Perfect! Aren’t they just the coolest and cutest things you’ve ever seen? The box they were in (yes, unbelievably their previous owner had never even opened them!) 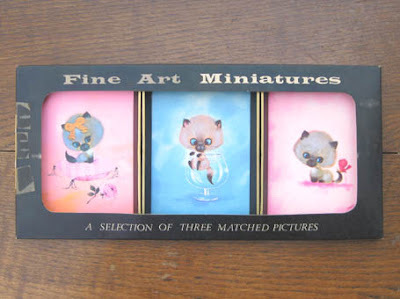 described these cute kitten prints as “Fine Art Miniatures”, but I prefer to think of them as works of sheer kawaii genius! And at a mere 75p for the set of three, I reckon I got one of the sweetest deals the world has ever seen! Isn’t it just great when stuff like that happens? Wow, Abigail, that really was one seriously sweet deal you got yourself there! Thanks for sharing! And if any other readers have got themselves a cute thrift shop deal, then be sure to let me know! 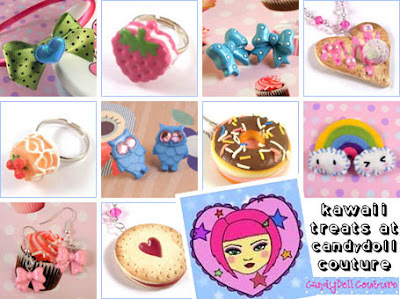 I think we’d all love to see what kawaii treats you’ve found! Oh dear, it looks like the Imp Mascot has had a bit too much fun with the old accessorising lark, and has decided the best way to achieve her “new look” is to “borrow” some choice accessories from her fellow mascots! And what did she pick? 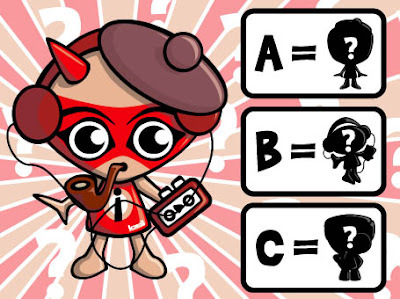 A: A hat, B: A personal stereo, and C: A pipe! And the worst part is… she didn’t even bother to ask for permission first! So the question is… can you work out which three colleagues the Imp Mascot “borrowed” her accessories from? Find out if you got all three when the answer is revealed in this month’s monthly round-up! Yes folks, it’s true, now all your pocket money problems are gone thanks to the amazingly cool world of Mighty Beanz! Woohoo! 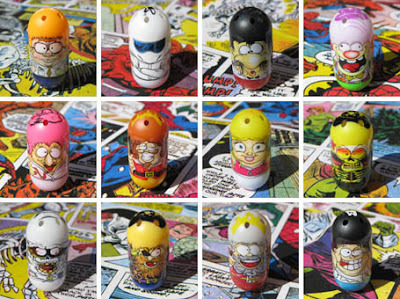 Mighty Beanz are collectible toys from the crazily creative geniuses at Moose Enterprises! They’re available in different sized packs (3 and 6 packs) and also in different series’ too - including Star Wars and Marvel! My collection (pictured above) is from series 2! So what are you waiting for? Get out and get collecting now! 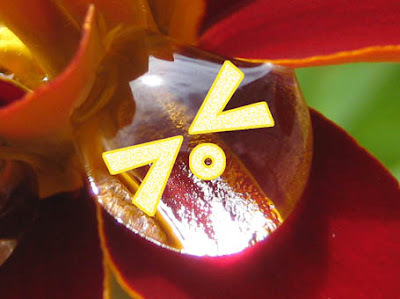 Yes, that’s right, it’s a kawaiified raindrop! You see, as a seasoned kawaiifier I was determined not to let the dismal weather get me down. And in doing so, I think I have created one of my finest works of kawaiification to date! Not to mention one of my most beautiful too! Anyway, I hope you enjoy this watery piece of kawaii fun, and I also hope your readers enjoy it too! After all, I think it sends a wonderfully positive message about the power of optimism! Absolutely amazing! Mr. Justice Smithering Smythe, this is without doubt the finest work of kawaiification I have ever seen! Simply incredible! Can’t wait to see what you come up with next - especially given the nightmarish weather we’ve had for the last two winters! Beautiful, isn’t it? 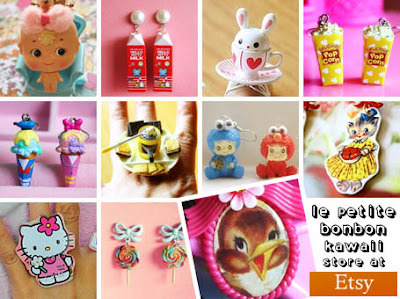 Le Petite Bonbon is an Etsy shop that sells adorably cute handmade jewellery and accessories for kawaii fans everywhere! And, with hundreds of different pieces for sale, you can be sure this is one shop you’ll be going back to again and again! In fact, I’m going to head back over there right now and have another look around! Why don’t you join me? 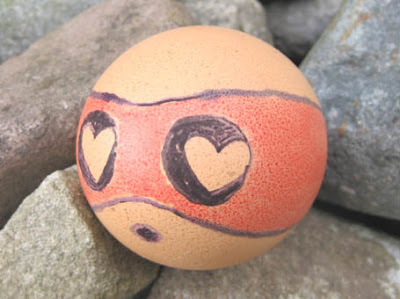 Yip, it’s an egg I’ve coloured in to look like you! I’m guessing Easter might have been a better time to send you this particular artwork but, like I said, I do get bored easily, and the idea of holding off on this creation for six months to wait for a more suitable time to make it didn’t really seem like a realistic option to me! Anyway, hope you enjoy it, and who knows, maybe if I get bored again (which lets face it, I probably will!) I’ll have a go at making something else for one of your colleagues! See? I told you I knew how to find adorable goodies :) Lisamax is an Australian designer who specialises in character based art and crafts. 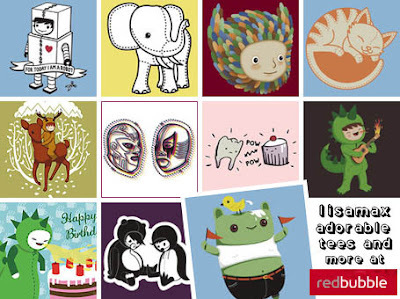 And at her RedBubble shop you can find some truly cute examples of her work on t-shirts, kids clothes, cards, and stickers - all of which are as beautiful and unique as the next! 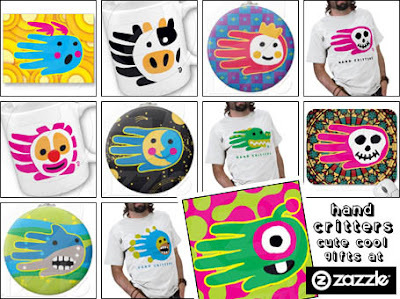 An absolute treat for fans of adorability everywhere! Have fun, folks! The expression “never count your chickens before they’ve hatched” could serve you well this month. Especially if you get your eggs from a supermarket! A weekend away in the sun may sound like a good idea, but the extreme temperatures of this celestial body make it a wholly impractical holiday destination! Stay realistic! Everybody makes mistakes from time to time, and unfortunately this month will prove to be your time - big time! Start preparing excuses now! Getting to know your neighbours is an admirable social endeavour. Doing so by relentlessly spying on them isn’t! Remember this distinction! An encounter with a man wearing a red hat could lead to an embarrassing situation this month. Or is it a green hat? Or blue? Best avoid all men just to be safe! A single shoe, a pencil sharpener, and an empty cereal packet will all play an important role in your life this month. Although, frankly, I’ve no idea how! An attempt to let your hair down could backfire on you this month. Remember: not everyone thinks free hugs are fun! You have been warned! Trying something for the first time that takes you out of your comfort zone can be a rewarding experience. Either that or a total nightmare! The decision is yours! A moment of spontaneity could change your life in ways you could never imagine this month. Unfortunately, however, not for the better! Be predictable! What seems like a good idea at night may not seem so clever in the morning. This is particularly true of Saturday nights and Sunday mornings. Remember this!